Large engineering processes need to be monitored in detail regarding when what was done in order to prove compliance with rules and regulations. A typical problem of these processes is the lack of control that a central process engine provides, such that it is difficult to track the actual course of work even if data is stored in version control systems (VCS). In this paper, we address this problem by defining a mining technique that helps to generate models that visualize the work history as GANTT charts. To this end, we formally define the notion of a project-oriented business process and a corresponding mining algorithm. 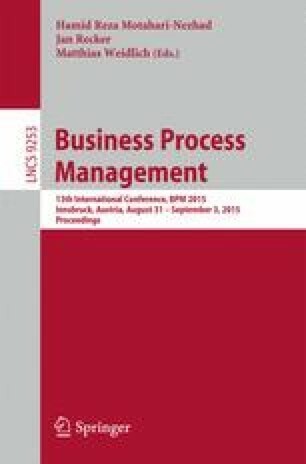 Our evaluation based on a prototypical implementation demonstrates the benefits in comparison to existing process mining approaches for this specific class of processes. This work has been funded by the Austrian Research Promotion Agency (FFG) under grant 845638 (SHAPE) and the European Union’s Seventh Framework Programme under grant 612052 (SERAMIS).